After Challenge Roth, treat yourself to an amazing itinerary that features three of Europe's most magnificent cities: Prague, Salzburg and Munich! We love this tour, and we're eager to guide you as we handle all transportation, five nights of the best accommodations, full daily breakfast, and the security of knowing you are traveling with highly experienced guides from RaceQuest. This tour is a family-friendly, small group experience. It's like taking a luxury "road trip" with short, scenic drives, access to unique experiences, and connecting with like-minded active travelers. We depart from Nuremberg on the Tuesday morning after Challenge Roth for our first stop, Prague, Czech Republic. This city is a beautiful, historical gem and we're staying in the best Mala Strana neighborhood at our premium, spacious apartments. Based at the Charles Bridge, on the "old city" side of it, you'll enjoy two nights of touring this lovely, friendly city. A full breakfast is included each morning; lunch and dinner are on your own. Laundry service is also available at our hotel for a nominal fee. The rooftop terrace view from our beautiful apartments in Prague, Czech Republic. On Wednesday we enjoy breakfast in a charming cafe' next door to our apartments before touring at your leisure in Prague and the surrounding area. 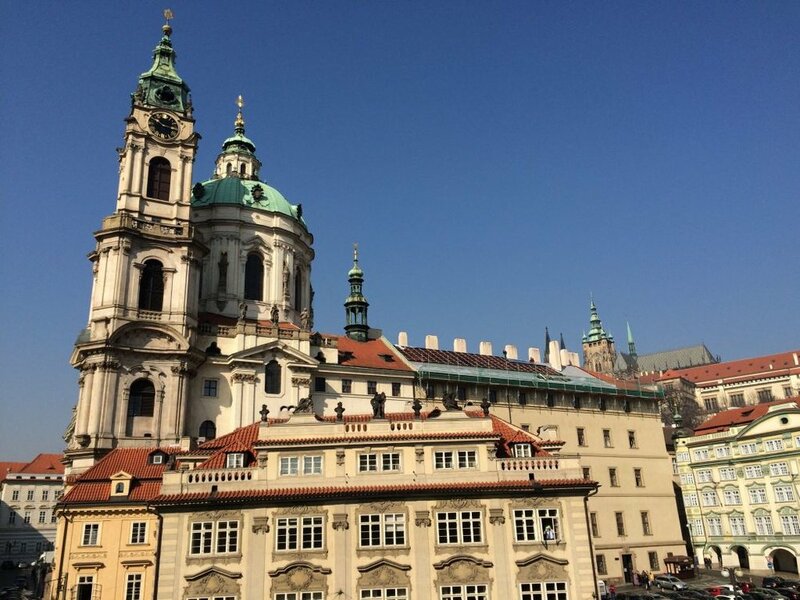 Take an open-top classic car tour, enjoy a Medieval show with a traditional Czech dinner, or check out the distinct neighborhoods that make Prague a truly world-class cultural destination. With a fully-equipped kitchen in your suite, you may opt to relax with a kaffe' and enjoy the view and energy of Praha. Thursday after breakfast we'll depart for a destination that's "alive" with the sound of music, Salzburg, Austria. This is an ultra-scenic drive in our comfortable Mercedes vans. In Salzburg we stay in premium accommodation. This is a beautiful time to visit! We'll stop for snacks on the way prior to checking in at our 5-star hotel in Salzburg. Your touring options include paragliding at Mt. Gaisberg or strolling downtown Salzburg on your own. Visit Mozart's home, take in an evening concert at Mirabell Palace, or just explore this delightful city on a cruiser bike or on foot. Arriving in Salzburg. Kick back and leave the driving to us! RaceQuest Travelers enjoying breakfast in Salzburg. On Friday, you may want to start your day with a light run from the hotel (maps provided), or a yoga class in our rooftop terrace. You won't want to miss breakfast at our hotel, full of fresh options from local farmers. Tour Mozart's home, see the Eagle's Nest, take a Sound of Music tour, or perhaps use one of the complimentary cruiser bikes at our hotel and cycle the area's awesome paved bike path system! Enjoy your evening in Salzburg and relax in our hotel spa prior to Saturday's departure. Saturday, we have breakfast at our hotel and depart for Munich. It's only about 90 minutes of driving with spectacular vistas. We check into our 5-star hotel at Munich airport, and board the city train for downtown Munich and the world-famous Hofbrau Haus, the world's largest outdoor biergarten. Shop, tour and dine in the Marienplatz district before our short train ride back to the doorstep of the hotel. It's great to spend this evening so convenient to our flights the next morning. The tour finale in Munich, at the Hofbrau Haus! Sunday, we say our goodbyes and catch our departing flights for home or further travel. Note that when booking this tour, you will want to set your departure for Sunday from Munich airport (MUC). Please inquire if you need flight selection assistance. Tour finale celebration in Munich on Saturday evening, prior to Sunday morning departures. Our hotel is located between Terminal 1 and Terminal 2.